My new full frame Olympus with the Olympus OM Zuiko 50mm f1.4 lens mounted on a Fotodiox adapter. Well I’ve done it. I’ve gone full frame digital with Olympus. No I’ve not got access to some top-secret prototype from Olympus. Instead I’m mounting OM Zuiko lenses on a “full frame” (I hate that term, I much prefer 35mm sensor) camera digital – the Sony A7r to be precise – with a Fotodiox pro OM-NEX adapter. Sony A7r with Olympus 24mm, 35mm and 50mm lenses. The Fotodiox Pro OM to Nex lens mount adaptor allows them to be mounted to the camera. I was left with a collection of Olympus OM lenses when Olympus in their infinite wisdom decided to abandon the OM mount – this did not occur with the advent of digital imaging, but back in the film era. I migrated to the Canon EOS system reluctantly and left my lovely jewel like Zuiko lenses sitting in a drawer. Every now and again I would get one out and fondle it. Oh the beautiful feel of the buttery smooth focusing ring with its long throw. The cool feeling of the metal body with that heft that instantly denotes high quality precision engineering. To cap it off and send me into a rapturous state is the aperture ring – firstly there is one, and then there is the feel and sound of that ring as you change aperture. Just thinking about sends me into the throes of ecstasy. Now it is a little known fact that when Yoshihisa Maitani designed the OM system he chose to make the flange distance a mere 46mm. At the time he probably thought that this would make a very compact SLR. But the unforeseen benefit of this decision is that it makes the OM lenses very easy to adapt to other cameras. Indeed when Canon brought out the ground breaking EOS 5d I was aware that you could buy an adapter to fit Olympus lenses to the body. But the experience was to me somewhat dismal. DSLRs really aren’t made to use manual lenses. It’s like expecting to find meat in a chicken McNugget. A disappointing experience. When Panasonic and Olympus announced the birth of micro four thirds in 2008 one of key features was the jettisoning of the mirror box found in SLRs. This has a couple of benefits. Firstly it means that a much shorter flange focal distance can be used. In ordinary speak this is the distance between the sensor/film plane and the lens mount on the camera body. Micro four thirds has a distance of 19.25mm which meant it was ideally suited to adapting lenses. I talked about this in April 2013 and again in April 2016. The second benefit was the provision of focus peaking. Focus peaking had long been found on video cameras by dint of them having an electronic viewfinder, it was quickly added to the feature list of mirrorless cameras. I first used it with the EM10 and was very happy with it. But there was a fly in the ointment. 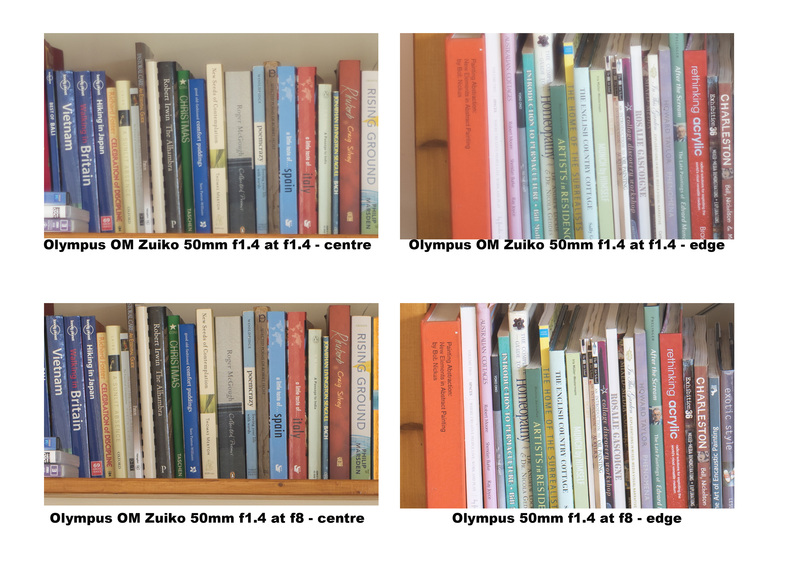 My carefully considered lens collection had been altered by virtue of the crop factor, basically a 50mm lens on m4/3 gives an angle of view equivalent to a 100mm lens on a 35mm sensor. Bugger! So apart from video use I put the old lenses away again. A little while later Sony heralded the launch of their A7 series of full framed mirrorless cameras and initially my interest was piqued but the reality of buying into another camera system (I was already running Olympus m4/3 and Canon EOS) was just not an option. So I feigned disinterest. But an interesting thing happened, Sony update their models with incredible speed and that meant the prices of second-hand A7 and A7r dropped faster than an Essex girl’s knickers. All of a sudden my beautiful OM lenses were restored to their full frame glory. Olympus OM Zuiko 50mm f1.4 at f8. 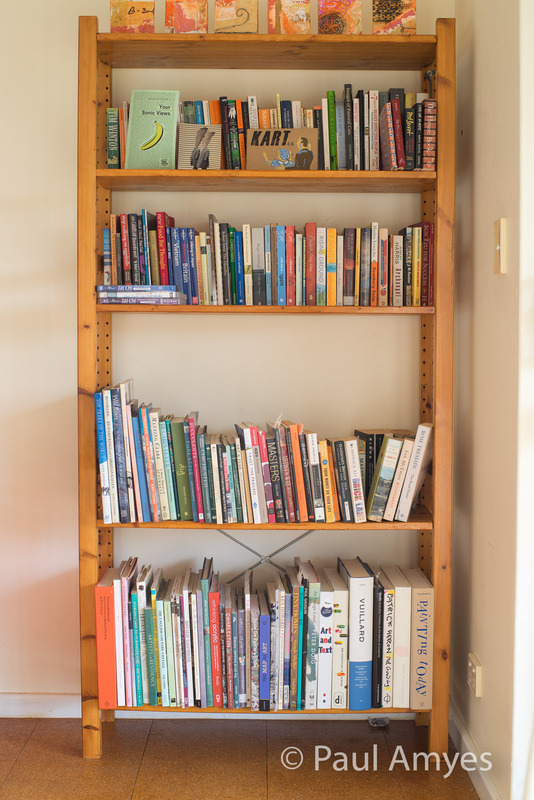 To test the lenses I shot a standard scene which was composed of a book shelf in my sitting room. Mounting the camera on a tripod I then framed up so that the complete height of the shelf filled the frame. The shots were taken wide open and then stopped down to f8. To see more detail in the test shots just click on the image and it will open in a new browser. This will be an evolving series of articles about using various OM lenses. The first lens most people whack an adapter on is a fast standard. The 50mm f1.4 was one of the original lenses that was introduced when the OM system was launched at Photokina in 1972. The original silver nosed (a term referring to chromed front mount ring) had a single lens coating and was 36mm in length.The newer MC version was introduced in 1984. Along with the new improved lens multi coating the design was changed resulting in a length of 40mm with a weight of 280g. The lens construction is seven elements in six groups. Despite being a fast lens it has a modest size and has a 49mm filter thread. Shooting my test subject one of the very first things I noticed is that the image displays very slight barrel distortion. This is where image magnification decreases with distance from the optical axis and makes parallel straight lines look like the edges of a wooden barrel. This phenomenon is usually associated with wide-angle prime lenses or the wide end of standard zooms. It does happen in standard primes lenses but usually only at close focussing distances so it was surprising to see it here. Wide open lateral chromatic aberration (CA) is perceptible and at f8 cannot be seen. In terms of sharpness at f1.4 the image is universally soft and lacking in contrast. Stopping down to f8 improves the image and the lens is sharp across the frame. The lens renders beautifully with a gentle fall off in tones and the bokeh is a delight being soft and smooth. The lens is quite resistant to flare and I haven’t felt any great need to put on a lens hood. The Speckled Egg Bicycle. A street sign on Avon Terrace in York, Western Australia. Taken on a Sony A7r with Olympus OM Zuiko 50mm f14. Shot at f1.4. In conclusion – well I always thought that it was a very good lens when I shot film and now having had the opportunity to mount it on a high megapixel digital camera I am not disappointed. If adapted lenses are your thing I would definitely recommend you to acquire a copy. * today’s musical reference is to the Moody Blues the pioneers of art rock and progressive rock.